I like transmission. A lot. I'm fascinated by the "smart grid" technologies being developed and even the policies and transmission "highways" we'll need to build to a) bring the U.S. electric system into the 21st century and b) bring the abundant renewable energy in rural areas to the urban areas where the power is needed most urgently. Transmission is a hot topic in Europe as well. 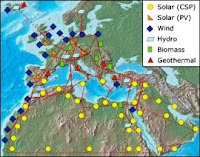 The newly formed Mediterranean Union - created to promote cooperation among the nations bordering the Mediterranean region - is considering the idea of a "Super Energy Grid" that would link Africa and Europe. It would connect geothermal energy in Iceland, biomass power in Poland and solar power in the Sahara. The "smartness" of the grid would allow countries to export the power when they have an abundance of it and import when there's an energy shortage. If you can connect the grid to hydro power, you've got that as a backup battery, and in addition there's wind. It's not a single source that's providing the energy but a combination of the different renewable energies. Africa gets a good deal out of this too. By using solar thermal generators instead of typical photovoltaic panels, the solar power plants could be used also as desalination facilities to provide clean drinking water and irrigation. Not to mention the job creation from the more than $60 billion dollars it would take to create the grid. UK Prime Minister Gordon Brown and President Sarkozy of France have voiced support of the idea. NGOs like Greenpeace are also supportive. Undersea cables to Sicily and Spain are planned for construction by 2012 and Algeria has started work on a solar plant for 2010. The entire project still has plenty of funding and technical challenges and it's not going to be built tomorrow, but it's terrifically encouraging that world leaders are seriously discussing such a project AND that some of the groundwork is being constructed. We should make our elected officials and energy companies take notice. In one of the world's first "standard" fight, the question of whether we would be powered by direct current (DC), in which electrons flow in one direction around a circuit, or by alternating current (AC), in which they jiggle back and forth, was decided in the 1880s. Edison backed DC. George Westinghouse's money and Nicola Tesla's science backed AC. The key reason backed then was that over the short distances spanned by early power grids, AC transmission suffers lower losses than DC. And thus it became the industry standard. Most of what I’ve been reading about tomorrow’s transmission – particularly linking Sahara-based concentrated solar power (a.k.a. “solar thermal”) with Europe, talks about a new grid that diverts from this current standard by used high density direct current lines (HDVC). HVDC cables can carry more power for the same thickness of cable compared with AC lines. Modern HVDC cables can keep energy losses down to around 3% per 1,000km and can also be used to synchronize AC produced by renewable energy sources. All of which means that DC lines become economically superior to AC if you're moving power more than 500 miles. DC lines have other advantages: they can help avoid the loop flow problems that affect AC lines, and they can be sited along railroad right-of-ways (AC lines cause induced currents if you put them near a long conductor like a railroad track). That could be important in the U.S. with its myriad NIMBY issues and concerns. China and other developing countries are currently developing national networks of 800kV DC lines, and I think a compelling case could be made for us doing the same thing in this country. We may not have to change everything. That’s where the 500 miles carry distance comes in. At that point, the higher cost of converting the power to DC and then back to AC is more than made up by the lower cost and higher capacity of the DC line. In other words, America could use DC for the long transmission haul to the coasts, and then convert it back to AC for commercial use.